Bananas Foster French Toast Casserole– A yummy breakfast casserole made with french bread, custard, and caramelized bananas and topped with a crunchy crumb topping. Perfect for holiday breakfasts and brunch! Today I am feeling a little nostalgic because we are making a variation of one of the first things I ever learned to make: french toast. I grew up eating french toast all. the. time. I definitely ate french toast more than pancakes. Shocking, right?! I have such vivid memories of making it with my dad and my aunt and my grandma. They all made their versions a different way but they were all amazing. Eventually, they taught me how to make it for myself and the rest, as they say, is history. French toast casserole, though, is a new member of my breakfast repertoire. I first saw french toast casserole on Pinterest and loved the idea for a breakfast or brunch where I had to feed lots of people. Casserole = one large dish instead of individual meals. And I am all for that when it comes to feeding a crowd. So I decided I was going to make it last year for Christmas breakfast. It was such a hit! My sister especially loved it. Like me, she grew up making french toast all the time. She doesn’t cook at all but I bet she still makes a killer french toast. So she really appreciated the dish. She’s even asking for it again this year. Success! When I saw this version from Allison at Celebrating Sweets, I knew I had to make it! Celebrating Sweets is one of my favorite new blogs to read because she has super decadent recipes that are both beautiful and easy to make. If you haven’t read this blog yet, you gotta check it out! She has a few different french toast casserole recipes on her blog, but this one is by far my favorite one. I mean, brown sugar and bananas?! That combo is unbeatable. Plus, we loooooove bananas foster and this reminded me of that. I know my sister is going to die when she tries this version for Christmas this year. I, on the other hand, could not wait for Christmas to try this recipe out. My husband was equally enamored with it so I decided to make it just for us. A whole 10-serving casserole, just for us. It was a fat-kid Sunday, for sure. Oh sweet Lord. The bananas foster french toast casserole was out of this world! It tasted so rich from the custard and bananas and sweet from the brown sugar. Yummmm. And the textures were perfect too. Super dense in the middle and crispy on top. Simply heavenly. I topped mine with whipped cream but I husband drenched his in maple syrup. You really can’t go wrong either way. Heck, go crazy and do both! Typically, french toast casserole is made the night before so the bread can soak all the custard up while chilling in the fridge. However, I did not plan properly for this one. I didn’t decide to make it until the morning. So I just started on it immediately and let it sit, outside the fridge, for a couple hours. I checked on it every half hour to help push more custard into the bread so it would drink up the custard faster. And it worked! The casserole tasted perfect! It tasted just as it would if I had make it the night before. But I actually recommend the overnight method since it’s fool-proof and requires less judgement since you just let it set overnight and then bake the next morning. No need to check on it, etc. But sometimes these decisions are last-minute so you’ll just have to adjust like I did, if you can’t wait. My little helper this morning. She loves to hang with me in the kitchen, especially on this window ledge. Isn’t she adorable?! You gotta use day-old bread. The drier and more stale the bread, the more custard it will absorb and the better the french toast will be. If you don’t have day-old bread, you can toast it in the oven to get the same effect. Make sure you get large bananas. I got smaller ones and realized that I needed about 4-5 since there wasn’t enough banana to spread throughout the casserole. If you don’t have large ones at your grocery store, you can just use 4-5 smaller ones like I did. Pure maple syrup is a must! This is the kind that says “real maple syrup” on the bottle; not the kind that has corn syrup and other fillers added to it. If it’s not pure maple syrup, it won’t have the right flavor that we need for the caramelized bananas. When making the custard, it’s important to mix the cinnamon with the vanilla and brown sugar first. This will help the cinnamon incorporate better once we add the milk and eggs. Ground spices tend to clump up when added to liquid. When you mix with the vanilla and sugar first, that will help prevent the clumping. I am so excited for you guys to try this out. Let me know how you like it! And make sure to visit Allison’s blog at Celebrating Sweets. She’s got some awesome stuff over there that you’re gonna wanna make right away. A yummy breakfast casserole made with french bread, custard, and caramelized bananas and topped with a crunchy crumb topping. Perfect for holiday breakfasts and brunch! Melt butter in a medium skillet over medium heat. Add brown sugar, maple syrup, and salt to melted butter and stir until combined. Mixture will begin to bubble. Continue to cook for a couple more minutes until mixture is smooth. Remove from heat and add bananas. Toss bananas to coat them in the caramel. Set aside to cool. Add cinnamon, vanilla extract, and brown sugar to a large bowl. Whisk to combine until smooth. Add eggs, milk, and half and half. Whisk to break up the eggs and mix together with the other ingredients. Grease a large casserole dish or rectangle baking pan (13x9 inches). Add half of the bread cubes to the dish. Spread half of the caramelized bananas over the bread cubes in the dish. Top with the remaining bread cubes. Pour custard mixture evenly over the bread cubes. Lightly press the bread cubes down so that they absorb more of the custard mixture. Top with the remaining caramelized bananas and spread evenly over the bread cubes. If making the night before, cover with plastic wrap and place in fridge to sit overnight. If making the morning-of, let it sit on the counter for 2 hours. An hour or so before baking, make the crumb topping. Mix melted butter, brown sugar, salt, and cinnamon in a medium bowl until smooth. Add flour to mixture and combine with a spoon. It won't resemble crumbs yet so don't worry. Refrigerate until it's time to bake the casserole. Once most of the custard has been absorbed by the bread, it's time to bake. Preheat oven to 350 degrees. Remove casserole and crumb mixture from the fridge. Grab a handful of the crumb mixture and crumble it evenly over the casserole. Repeat with the rest of the mixture. Bake uncovered casserole in preheated oven for 40-50 minutes, depending on the consistency you like. Bake longer for a crispier french toast and less for a more wet french toast. Serve immediately with syrup, whipped cream, or both! Wish I found this recipe early. It looks easy to follow and to make. I can’t wait to give it a try. It will be the first french toast I make xD I hope I can make it look as tasty as yours. By the way, any advice for someone like me (a beginner)? I have a few tips in the post so take a read at those and you’ll be all set! Bananas foster is my fiances favorite dessert, he would love this! I’m going to surprise him with it for Christmas morning breakfast! Perfect! I hope everyone enjoys it! Oh my goodness, I would start eating this at breakfast and not stop all day long. So yummy! Now this is my kind of breakfast!!! Mostly because it’s also close to dessert, and I just can’t ever bring myself to turn down any kind of breakfast casserole. Cannot WAIT to try this one out! Amen to that, sister! It’s such an honor to have you visit my site, Karly! I love everything you do and follow Buns in My Oven religiously. You made my day! I agree with everybodye lse that this would be a great christmas morning casserole! Holy moly, this is like the grand-daddy of all French Toast! Excuse me while I go make some right now! Love the sound of that crispy crunchy tip and soft and moreish middle. Can’t wait to try! The texture is my favorite part! Hope you love it too! Yessss! Thanks for stopping by! You have just upped my Sunday brunch game girl!!! O-M-G I don’t even know if I am gonna want to share this one with my hubby! Love that it gets crispy on top, I am a big texture eater so that makes me one happy girl! Thanks for sharing! Haha yesss! I am so glad to help out! What a great idea for a brunch! Thanks for this elegant, tasty & quick idea. Oh my gosh! This looks amazing! I would eat the whole pan myself. It is so hard to practice self control with this breakfast! Who says these are only for holidays! Looks absolutely marvelous and I would eat this any time of the year. Oh my goodness, this recipe looks PERFECT for the holidays. Pinning for later. This looks sooo good and the presentation is beautiful. This is added to the must make list! Heavenly. This looks absolutely heavenly. I want it for breakfast this weekend. Omg yum!! Need to make this! 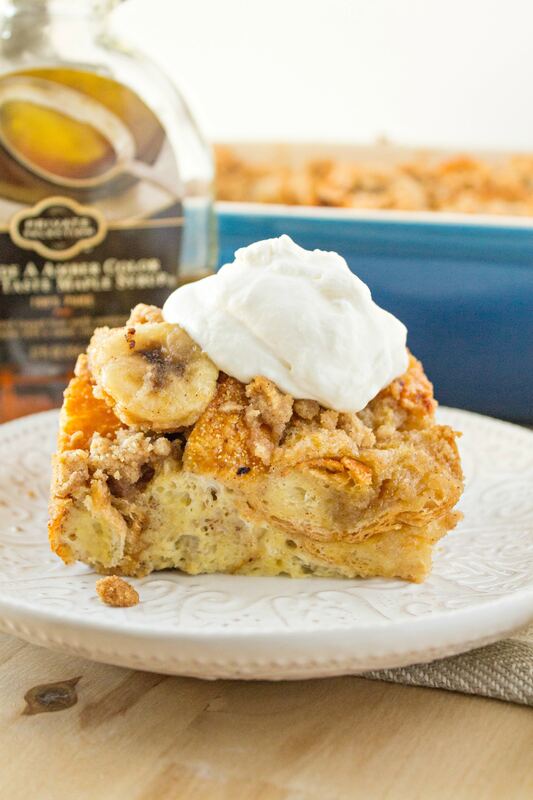 Love all things bananas foster and French toast casseroles! Yess! It’s the best of both worlds, for sure! this looks so delish! pinning for sure! Nope it’s not soggy! But it you want to mitigate an issue, you can just let it soak in the morning, instead of overnight. And also cook it for longer. That way, it crisps up and won’t be wet at all. Plus, the crumb topping is crunchy so that will help give it more texture. Hope that helps! Aw you are so welcome! It was true and honest feedback. You are in inspiration! And I am so glad to provide a tip to the pro! It was a super spontaneous change that worked out for the best. Do the bananas turn brown if you use the overnight method? The bananas will be caramelized so they will already be darker in color from cooking them in brown sugar. But I don’t think that using the overnight method would add anymore brown to them. Thank you for your comment! Haha yes!! I have no qualms with eating it without the french toast, but at least this way, I will get shamed less by my husband. Oh my goodness, this looks so delicious! I can’t wait to try it! Thank you!! Banana fosters is my FAVORITE! I love it with a dollop of vanilla bean ice cream. This looks so yummy! Yesssss. Bananas foster is so good! And, shall I say, even better in this french toast! This looks amazing. Adding it to my life of family weekend breakfast ideas. I just made a similar recipe for church yesterday. Yummy! Awesome! I hope it was amazing! I love making breakfast casseroles especially for our church functions. Serve many and can be made the night before and quickly made that morning. This looks delicious! And your cat is so cute! Oh my goodness this looks so delicious! Pinned! Omg you just made my day! Thanks so much! If your future chef has any special requests, send them my way! This honestly looks perfect for Christmas morning! I love casseroles – they’re so simple to throw together, yet so delicious! Exactly! Rise and bake, baby!